I trust you as a Doctor but now you’re a Businessman do you mind if I have an itemised receipt? 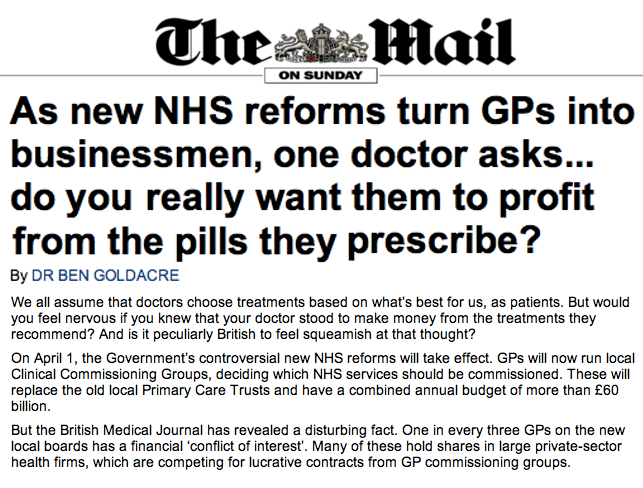 This article in the Mail by Dr Ben Goldacre highlights a growing awareness amongst Patients of the “Businessman” role that their GP’s now have. The clinical evidence supporting the need for patient access to documentation of clinical encounters is abundant and largely ignored (even though Patients and Carers are very vocal about the impact it has on their lives) so I’m hopeful that greater Patient awareness of a GPs business role will in turn lead to better patient access to documentation of clinical encounters. Momentum is building as a result of the hard work of Patients who are championing the importance of letting patients help but I get a feeling that this change in the NHS is more likely to happen from Doctors wearing businessmen hats. Just as the Airline industry woke up to opportunity (or had to compete with others who took it) to lower operating costs by listening to their customers desire to browse their schedules, book their own flights, select their own seats, etc, etc. I think Doctors with businessmen hats are going to realise that letting Patients use consumer tech (like their mobile phones and the internet) to share their medical information and to provide them with detailed written records of their consultations will advance the effectiveness and efficiencies that are at the core of the service they offer.